After our cruise up the Yarra, Kismet was very dirty with scum and dried salt. 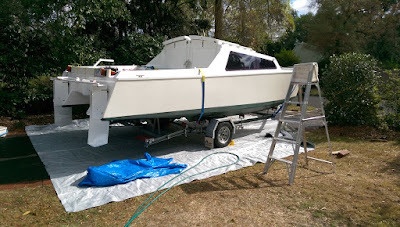 We don't have any boat washing places within a 45 minute drive wash-so at-home it was to be. I used the tarp normally covering the boat as a water capture and arranged the sides so no salt could get on our garden or the nature strip. 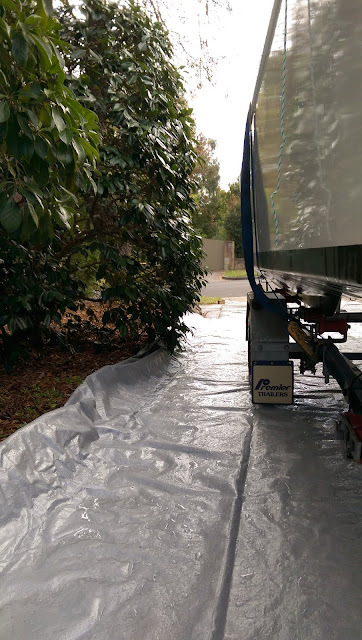 I lay another tarp in front of the big grey one (across the footpath) and rolled the sides to form a gutter. Setup and washing took about 2 hours. The minimal salt from washing your boat shouldn't worry the lawn or garden... How do you secure your rudders down? I've already damaged our front lawn so I'm just being very cautious. At this stage I'm using bungy cord around the bottom of the rudder boxes to hold them down.